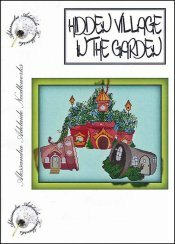 Hidden Village In The Garden [C7285] - $15.88 : Yarn Tree, Your wholesale source for cross stitch supplies. Cross stitch pattern by Alessandra Adelaide Needleworks. Look at these cute pots that have been made into a village garden! This design would be perfect for that gardener in the family. Stitch count 236w x 195h.